A through-valve-leak is an internal valve loss originated by a seat – shutter interface. These improper dispersions from critical valves, such as safety valves and shut-off valves, can cause massive energy and product losses. 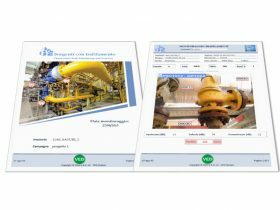 Our TMS program starts with a preliminary analysis of industrial processes, PFD, P&ID, and fluids safety card, realized in collaboration with plant technicians. The next step is to identify, characterize and mark the lines on every P&ID. 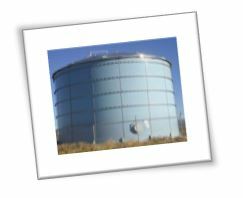 Characterization can give information such as device name, diameter, line code, fluid nature and composition, and H350 classification, to create a recorded data archive for every source. We create a photographic census for every line, we organize every single source and identify it with a numeral tag on its picture. The picture has also got a device reference. All the pictures are related to sources recorded data (diameter, fluid characterization, and composition, stage, etc. ), and are used to create a complete archive. 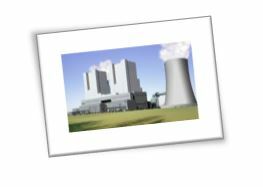 Monitoring is realized through the use of ADD (Acoustic Detection Device). 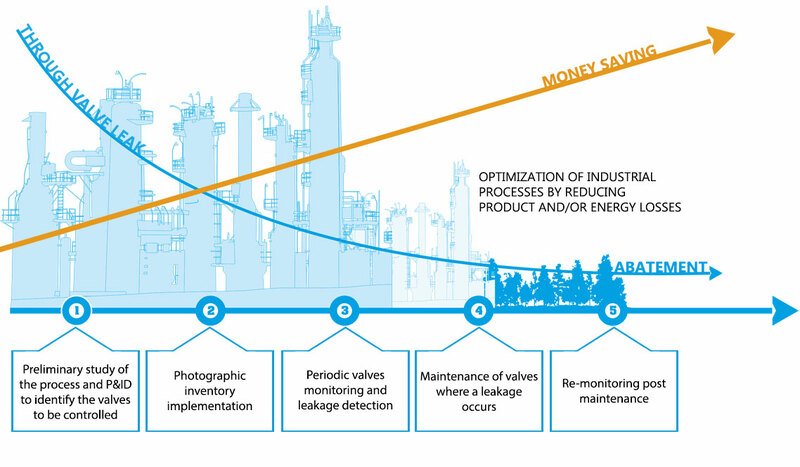 It permits to identify through valve leaks and to quantify the resulting loss. Monitoring technology using ultrasounds is called BAMM, Best Available Monitoring Method, by EPA. It is also mentioned in US EPA GREENHOUSE REPORTING MANDATE 40 CFR 98 SUBPART W.98.234.5 norm, where it is defined as a loss a 3,1 SCF/h through valve leak. We use a contact measurement: we put an ultrasound sensor on the external source surface, to guarantee non-intrusive monitoring operations. For every inspected valve, we take three measures: upline, on the body, and downline of the valve, to calculate the ASL (Average Signal Level). Upline and down line measures are taken to minimize the background noise, not to modify the results. 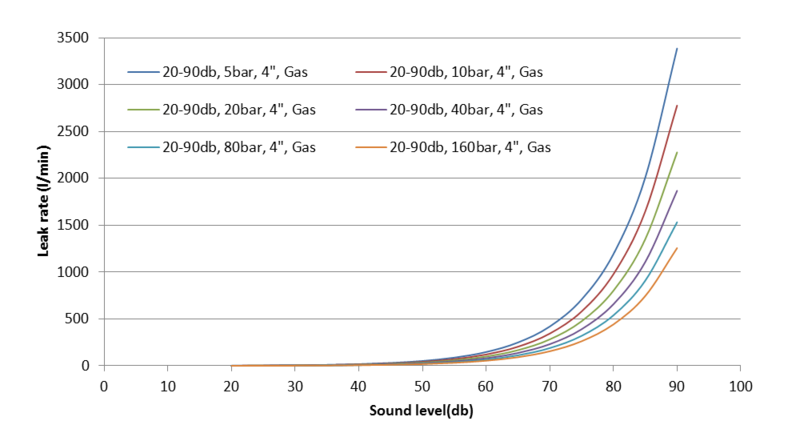 The ASL decibel recorded value results proportioned to the amount of substance from which the noise is generated. An internal instrument algorithm, specifically developed, translates the recorded sound in loss mass flux (l/h). Monitoring losses inferior to 1 l/min is possible. 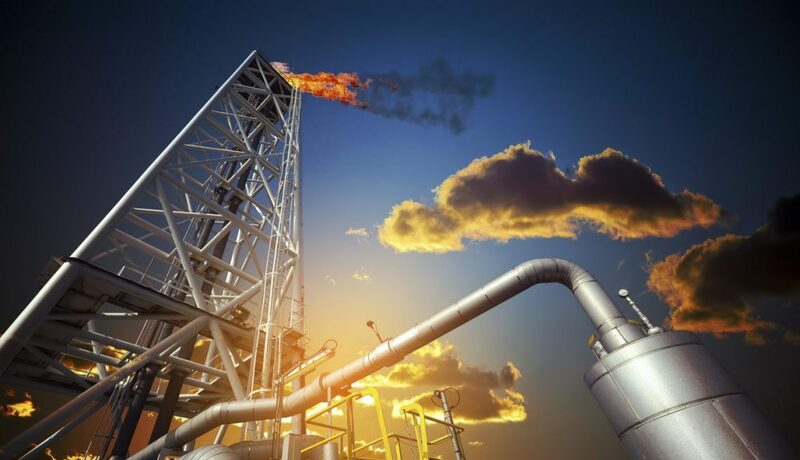 A dedicated device allows the monitoring of high-temperature valves. During monitoring operations, our technicians identify every through-valve-leak-sources. Every source is tagged with a descriptive plaque. 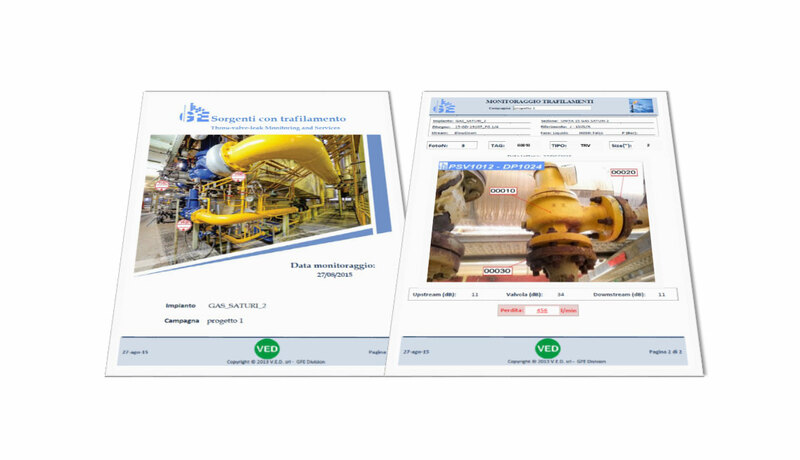 At the end of every monitoring day, we send a photographic report with information about all the sources affected by through-valve-leak problems. This report helps to cross-check every plants’ conditions data. LACUS is a dedicated software developed for a TMS program intuitive management. It allows to interact with involved data and processes and gives you a great device to optimize maintenance. Quick sources research: through the use of multiple filters, it is possible to realize a meticulous research of every source. Critical sources: a dedicated window permits to quickly search for all the critical sources. Archive: it is possible to visualize and extract an archive of every monitoring and maintenance operation. Consulting every emission trend is possible. It is possible to export every data in excel or pdf files quickly. 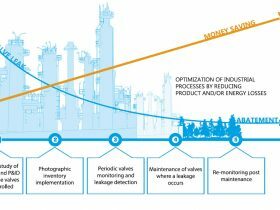 The blow-down circuit has a significant role in the industrial production cycle. It contributes to keeping stable processes conditions, intervening in particular cases to adjust critical parameters such as pressure and range. With the passing of time, interception and safety valves of BD circuit can generate a through-valve-leak. The consequences are significant losses of product addressed to in torch destruction. 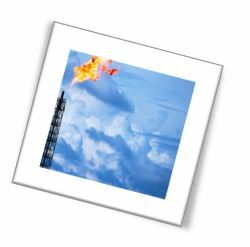 TMS program permits a prompt intervention on sources with through-valve-leaks problems, and prevent large product dispersions. 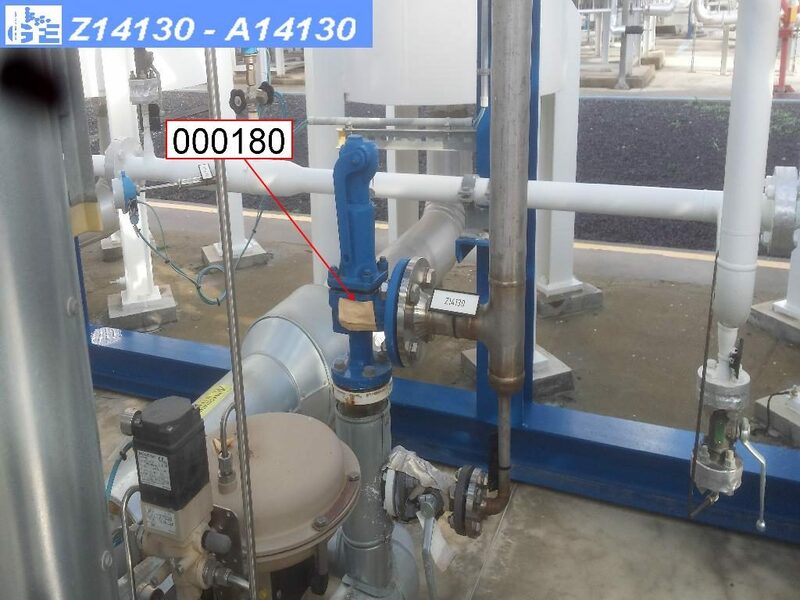 The inspection of intercept valves located in the interconnection pipes nets of the tanks allows the identification of through valve leaks, which can cause great losses during handling processes. 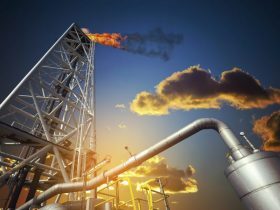 In energy production processes, the monitoring operations of through valve leaks in the steam circuit are used to identify and remove energy waste, which is otherwise improbable to detect. Thanks to our TMS program, we can rapidly operate on sources with through-valve-leaks problems, optimizing productive process efficiency and increasing the energetic performance. During the steady stage of the plants, interception valves can block the process flux, allowing to work on the upline plants lines in safe conditions. 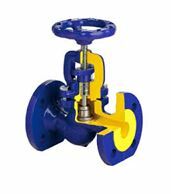 It is essential that these valves are working with extreme efficiency. 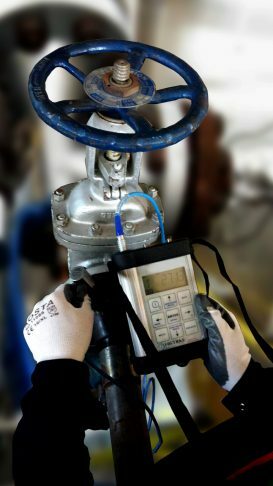 The scheduled inspection with ultrasounds technique allows us to verify the right valves serviceability and to identify eventual through valve leaks before causing industrial accidents. WOULD YOU LIKE TO RECEIVE FURTHER INFORMATION OR ASK FOR A QUOTATION? CONTACT US, WE’LL BE GLAD TO ANSWER IN 24 HOURS!